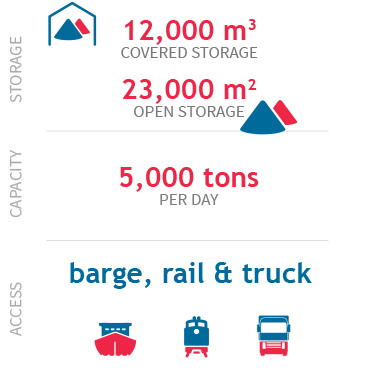 Ideally located in Ghlin (Mons), close to industrial basin of South Belgium and North France, Deschieter terminal offers unique combination of land based storage and inland waterway logistics services. Besides the terminal’s barge services, there is excellent access to road and rail. Its facilities and equipment ensure efficient and safe handling of bulk and breakbulk products as well as containers. The terminal is outfitted for inland shipping, transhipment, handling and storage. Deschieter has two docks and large open and covered storage capacity. Its dedicated barges ensure that a direct container line service between Antwerp / Zeebrugge and Mons.